I did my first product review for a super fun new product called, Eraselets, on mysKoop. 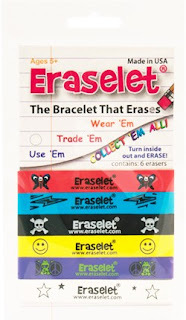 They are bracelets that erase! They come in all colors and designs. My girls LOVE theirs! Go check it out and enter to win a pack! They are gonna be the next big thang yall. Fo reelz. Can you say perfect stocking stuffers? And what the what? Today is 11/11/11! Cool. Looks like something Brooke would love !!!!!! Will check into it :) Thanks for the SKOOP!